Good morning! Just a quick reminder that Happy Skin will be closed for deliveries from September 22 until October 20 2017. While we are away, we will accept orders, however; delivery will not happen until October 20, 2017. There are about 50 various fragrance oils waiting for us to inspect and snort and choose which we want to offer. We also have all sorts of ingredients to play with, our new assessor for product certificates are set and ready to go, and lots more to see and do! Stay tuned for the Refer a Friend to Happy Skin Lucky Draw! Follow us on Instagram and on Facebook to see the shenanigans we get up to! Featured image is from this link. Ah. The Enchanted Nights Limited Edition Luxury Gift Box Set. This box is the ultimate in gift giving to an expat. Especially an expat in China. Chinese versions of scented products are very different than the scent profiles enjoyed by expats. We like a little more bold or an edge or things a wee bit more complicated in our products, we like our lotions to leave behind a scent, one that compliments the scent of our perfumes or just makes us happy knowing that we smell like grapefruit or in my co-workers mind, coconut. Which surprisingly enough, are scents I’ve found many Chinese people don’t seem to like. I don’t think I have ever smelt a coconut scented product here in China before. They seem to be more into the light grassy scents like green tea, bamboo, and cucumber. Don’t get me wrong, I love the scent of bamboo and green tea is growing on me, but I like my bamboo as a room spray more than a body lotion or as a body spray. And I love love love cucumber in my face care. But, I like my scents to be unique, to make a statement, to identify me as an individual. When you ask Chinese people which kinds of scents they like, their reply is always the same, “Fresh”. Well darling, “fresh” could mean a whole whack of things. Citrus, floral, cotton, blossom, rain, water…. Or they seem to have a weird fascination with Chanel perfume. Simply because, Chanel is a popular brand. Go figure. The colours black, white with a splash of red were chosen for the line as old fashioned masquerade colours. So one of the glorious things of making your own skincare items is I get to scent them however I want too. And this time around? I wanted exotic. I wanted sensual. I wanted something elegant and sophisticated. I wanted something I’ve never done before. I wanted something to make the people I walk by stop and sniff the air and think oh good god, that’s amazing! And above all others, I wanted a scent to identify with for late Autumn and early Winter. So that’s what I made, not only for me, but for you too. Taking three of my favourite scents and combining them; benzoin, labdanum, and vanilla into a pure bliss scent with just the perfect amount of sandalwood tossed in to ground it. This scent truly is a statement of a scent. This heavenly set, is all the same scent. Winter is almost upon us, and what does that mean in the fragrance department? Heavier, heady scents like vanilla and various other resins and spice scents stuff come running out the door. And layering scents is a sure fire way of getting your scent to last as long as humanly possible. And unless you’ve another Happy Skin customer in your city? You’re the only one who could possibly smell this good. Trust me on this part, it’s not always fun having Sonia in the same city, work building and apartment building. More days than I can choose to count, we meet in the elevator to go to work, only to discover we are both wearing the same scented something or other. But it does make traveling together very easy. The packaging had to match the scent, so old fashioned meets modern ideology of historical romance. And I have always loved sealing wax and seals. A sealing wax kit is a common gift from me to people, so this set had had had to have them. Starting in the shower. Wash yourself down with this giant bar of luxury made with wheat germ oil to give it an unimaginable boost in the luxurious department. This soap is not only a luxury, but high class luxury. Wheat germ oil is very good to aid in rejuvenating overworked skin by re-hydrating it, and is ridiculously high in vitamin E. It’s an anti-oxidant which can help help to make your skin age gracefully. Can you imagine your afternoon shower before a date beginning with this sensual scent? Or choosing for an evening in and wanting to imagine yourself bathed in a sea of silk and satin? Yup. I can. Then, lather yourself up with our brand new lotiony hybrid of Body Butter and Summer Silk. It takes the awesomeness of both, to make it a little lighter without being cloyingly heavy feeling. It is perfect for warmer Autumn days and cooler nights with the barest amount of shimmer for that elegent feel. You’ll be left feeling soft and silky with delightful touchable skin. I would describe wearing this lotion like wearing a pair of satin pajamas. Your skin will feel smooth, silky and like someone- yeah. If satin were a liquid, imagine this poured over you without leaving a greasy feeling. It sinks in like a dream leaving behind a lovely silky feeling. The Enchanted Nights Body Silk is made with oodles of wheat germ oil, shea butter, aloe juice, silk, oats and more. And then, the cherry on cheesecake, the heels that tie your whole outfit together? A Body Quench. This Enchanted Nights Body Quench is designed to be sprayed over your skin after lotion locking in the scent and moisture. This Quench has Vitamin B5, silk, oats, real vanilla, and aloe. All these ingredients help to form a barrier for your skin to keep it happy and radiant. It can be used safely as a light hair mist to tame fly away’s or just to scent your hair. If you have oilier skin and don’t need a lotion quite yet, the Enchanted Nights Body Quench is just the thing. It provides me the perfect amount of hydration without being overly powerful. But I still want it to be colder so I can wear the lotion! Lastly, there is the Enchanted Nights Fragrant Bomb. This little dropper of beauty is your key to making this scent last as long as can be or be as powerful as you could possibly want it to be. To use this Fragrant Bomb, all you need to do is add a drop to your hands and massage into your hair as a hair serum. Or add a drop or two (or ten!) to your unscented lotion to give it a scent boost. You could even apply this directly to your skin if you’d like for a powerful scent punch. Made with vitamin e, argan oil, coconut oil, wheat germ oil and rice bran oil, it sinks in quickly. If you plan to wear it neat, as soon as you step out of the shower, while still wet, apply a few drops to your hand and rub into your skin. This set is heavenly. This set is sensual. This set is purely exotic of the old world variety. And you’ll never find another set like this in China. For thre are only ten sets for sale. Enjoy your limited edition Enchanted Nights Gift Box Set before they are all sold out! Stay tuned to the Happy Skin Wechat account for ordering details. If you are really keen on getting one early, don’t forget about the Refer a Friend to Happy Skin Lucky Draw still in effect until September 20th! First place winner will receive an Enchanted Nights Box Set free, and we’ve arranged for it to be delivered the day of the Lucky Draw. So you will watch us pick a winner in Ireland, then message our SF delivery man in China your address and you will get it in about four days. The very first person to get their hands on a set. Weeks before anyone else. I so wish I were you. This is my absolute favourite picture of the set, so had to include it. August is HERE! And that means summer is almost over! YAY! We’d like to say a huge thank you to everyone for being patient with us and helping to make the delivery to SFexpress transition smooth. Our regular delivery man is a very happy character and wanted to pass on his thanks to you as well. In July, we began an official Happy Skin Samplers Program, where we asked a few of you to join us as samplers. It was a very interesting learning experience for everyone involved. And we are pleased to tell you that the Citrus Burst Hydration Booster, Citrus Burst Toner and the Cucumber Mint Toner all have had amazing feedback. Samplers received enough product for a week and were given instructions on how to use it. So far, the only complaint was that there was not enough product to last longer than seven days! We are always looking for new samplers! So if you fancy yourself great at providing feedback, leave a message. Between July 1 and September 20, we will hold a competition; “Refer a Friend to Happy Skin”. For each friend of yours who places an order over 150rmb during the competition period, your name will be entered into a Lucky Draw, then we will pick two names. Those winners will receive a Gift Basket from Scrub Me Down- Happy Skin valued at 500rmb. We plan to be in Europe (ingredient shopping YAY!!!!!!) around this time, so we will do a live streaming of the draw so you all can join us as we put all the names into a hat to draw. We originally wanted to do this in China, however; “it’s illegal for foreigners to do any live streaming”. So winners will be announced from Europe and your 500rmb Gift Basket will be mailed once we return October 20. This past month was also my (Barb) birthday, and we enjoyed giving everyone who ordered a wee thank you gift to help me celebrate. Did you enjoy your gifts? What did you get? We are happy that August is finally here, and the Lunar Calendar is telling us that there should be one more massive heat wave coming our way, and then blissfully it will be officially Autumn again! Cold weather means body butters! YAY! ScrubMeDown- Happy Skin, The Blog. This past month, I’ve been posting a few more DIY recipes of things I’ve been playing with in The Kitchen. And it’s been fun to share the inspiration, the explanation process, the making and the results with you all. We’re hoping that you have been enjoying them too. I love hearing about why someone chooses one ingredient over another in recipes be those recipes for baking or for skincare. July is finally over and that means one more month of summer intensive studies at work. It’s great to see the same kids daily, but also takes its toll too. I’m the only teacher in the classroom with a bunch of kids who cannot speak English, no helper, I’m not allowed to speak Chinese, and you try getting 8 tiny humans to line up or to explain a new phrase? It’s a wonderful challenge, but mentally exhausting. By the end of the week, I’m so mentally wiped out and cannot think! My wall and I have been spending a lot of time together on Friday nights. We are just beginning to get our Autumn and Winter ingredients in the mail, which makes me all giddy with excitement as that means SOAP!!! We are hoping that next week will find us making the first batch of some awesome Hallowe’en inspired soap. And then go crazy making Christmas soaps! Yes! Winter is coming! Here’s hoping August finds you and your loved ones happy, healthy and safe! What have you been up to in the past month? What are your plans for the next month? Good day Lads and Lassies! June was a VERY eventful month! Let’s tuck in and I’ll try to keep it short. Happy Canada Day! There has been so much going on in the SMD Kitchen it’s like we have been dancing on hot coals moving about so much! We cannot wait to share some of our new creations with you! I have been working hard learning how to keep quiet about all the new creations and products coming out and Sonia has been a great test subject. We’ve had a lot of successes and a couple failures (here’s looking at you green tea extract! ), but that is the fun of creation! We will unveil them soon! Never fear! But, to tell you a quick secret, something that you’ve all been waiting for is in the final phase of testing… It’s exciting! It’s taken about eight months, but we think it is almost ready! One last test to go! 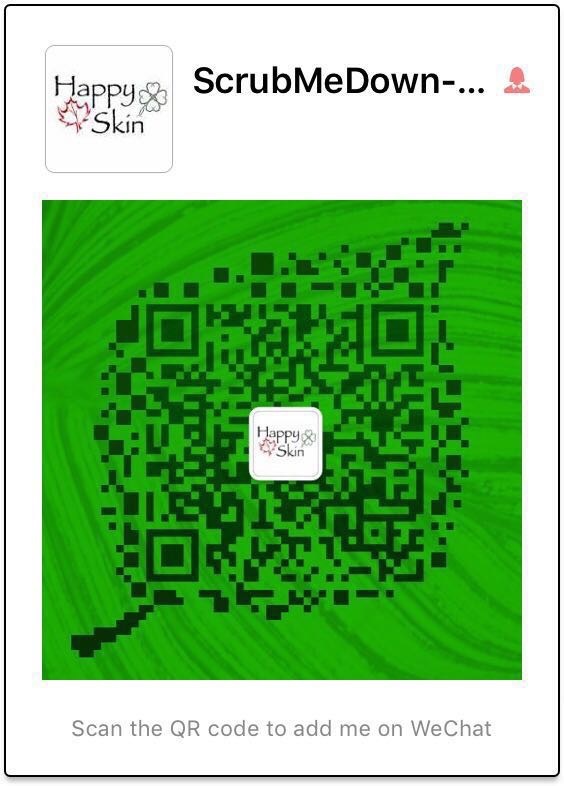 Scrub Me Down- Happy Skin got its own dedicated WeChat account! We are working on getting it registered and officiated and signed, chopped and sealed. But, with none of the information in one place, all the running around to get it done is proving much harder than it should be. So be sure to add ScrubMeDown on WeChat and be in the exclusive know about special sales, give aways and more! Blog: The blog is coming along nicely, we’ve been adding more DIY content to the blog as that is part of the DIY culture. To share. We have been working on narrowing the content; we want to keep it more skin care and product related, with the odd little bit of China and The Move sprinkled in. We really wanted to have some “Life of an Expat in China” but when you think about it, life here for us is pretty normal as we’ve both been here for so long. We’re not all that shocked when things happen. And, teaching. Do you really want to hear about teaching? We have begun seriously talking about doing some videos to upload onto YouKu and YouTube and maybe some workshops, so if anyone is interested, please let us know! Delivery+Packaging: You may have noticed that in the past month we’ve upped our packaging to make them a much more of a luxurious and sensory experience. We are both VERY excited about this and have actually mailed ourselves some Happy Skin Products just to see it from your point of view. Who are we kidding here? I just wanted a swanky present!!!! We’ve also had some nasty issues with some of the various cheaper delivery services of packages not arriving or packages that looked like it was the meatball from the Spaghetti Song. We made the decision to use only SFexpress from now on. And to make it an even awesomer experience for you all? SFexpress even has an English website! So tracking your order is even easier and more reliable than ever before. Our delivery prices begin at 20rmb for the first kilogram and 30 for the second. AND, and this is so very important, please pay attention: It truly is terrible when your order can’t be delivered on time for something as simple as you didn’t give me your city’s name. If you could fill out this template and send it to our WeChat in one message, in Chinese, NO PICTURES PLEASE. We are also looking at expanding Scrub Me Down- Happy Skin over the next few months. And since our only real form of advertising is by word of mouth, we will have an awesome competition! So, between July 1 and September 20, we will hold a competition; “Refer a Friend to Happy Skin”. For each friend of yours who places an order over 150rmb during the competition period, your name will be entered into a Lucky Draw, then we will pick two names. Those winners will receive a Gift Basket from Scrub Me Down- Happy Skin valued at 500rmb. We plan to be in Europe (ingredient shopping YAY!!!!!!) around this time, so we will do a live streaming of the draw so you all can join us as we put all the names into a hat to draw. We originally wanted to do this in China, however; “it’s illegal for foreigners to do any live streaming”. So winners will be announced from Europe and your 500rmb Gift Basket will be mailed once we return in October. Products: We have begun working on some Autumn and Winter ingredient hunting. Winter is coming! We’ve just started July and already we are thinking of next season. As mentioned, we are also busy planning our trip to Europe for ingredients, workshops and paying for some classes! That’s right! We want Scrub Me Down- Happy Skin to be not only backed by years of hands on work and experimentation, but we want to have the certificates and diplomas from accredited schools. Back to school we go! While in Europe, we will also be getting some of our more popular products tested by laboratories. Europe/UK is the only place that demands anyone and any company who sells skincare/cosmetic items to have every product assessed, certified and registered with the government. And since the EU has the strictest laws to follow regarding cosmetics/skincare/labeling we’ve been following their guidelines for products. We might end up in Europe or North America, but we’ll have a leg up anywhere we go with those product certificates. Summer Orders: as you all know, both Sonia and I work at training centers and it’s summer time. And that means summer intensive programs. My schedule will give me weekends free to prepare and ship out orders. So if you order on say Tuesday, it won’t go out until the weekend. It seemed like the month of May flew by. Like a hungry Superman spying a stack of freshly baked cookies. That fast. Work is crazy, my co-worker finally returned to work which means a large bag full of goodies to play with. Thank you Lotion Crafter and Belinda! Yesterday we spent the morning making aloe vera gel. Actual, real life, aloe vera gel. And holy smokes its AWESOME!!! Just that wait part is killing me. I itch to stir. More on that later! I’m currently writing the blog post for that one. The eye serum. That eye serum I am beginning to think I shouldn’t mess with it. I’ve tried a few thickening recipes and both times it failed. Miserably. I ended up using them as face masks and then they dried and spent the rest of the night trying to peel the mask off my face like a sun burn. I’m trying again with various gelling ingredients to see how they work. The toner was perfected and is now pumped full of vitamins to keep the face happy. Once you get used to the smell! This past month we had an awesome surprise, a customer came to visit during the Dragon Boat Festival. Check out her blog about some of the antics we got up to! She brought up some excellent suggestions, especially about workshops and teaching people how to make stuff. That is what we’d like to eventually do once we are settled somewhere. We never thought about it in China. But Sonia and I are both teachers and passing on information is awesome fun! So if you are currently in China and would like to learn how to make some soap or lotions, let us know! We’ve made a slew of soaps this past month in preparation for this summer and next summer. We are both private training center teachers which means when public schools have holidays, we have our busy season. And, it also means that come early July, we can start making the Autumn/Winter stock of soap, lotions and potions. I cannot wait! My house will reek of peppermint soon! We had some pretty cool sales on this past month, which we have decided to keep while supplies last. The Summer Silk Hand & Body Lotion is a light and highly moisturising lotion. It’s filled with vitamins for the skin, lightly fragranced and makes your skin feel like silk. I’m wearing the Lily of the Valley Summer Silk right now! And I am loving the scent! Very spring! Soaps are curing nicely, and it will be sad to see them go to their new homes. Stay tuned for the blog post on how to care for your new soap to get the longest possible use out of it. Especially living in China where the humidity is terrible. Enjoy the sales! Have a great June!